I'm slowly cultivating a list of my Top 10 local producers present at the many marchés of Paris and, as I work through my list of marchés by arrondissement , I find that it is rather difficult to find even one local grower at these not-so-farmer's markets. 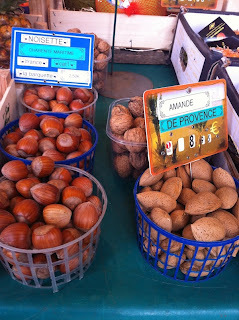 A case in point is the Marché Jean Jaurès where, on my visit in the early afternoon last Thursday, I noticed that none of the vendors were attached to a particular farm or region in France. Granted, I should get to the market earlier (add this to the list of this blogger's New Year's Resolutions) when the market is probably more abuzz, but I find it is often the case that the stands are filled with fruits and legumes from all over and nowhere in particular, with the vendors having no specific link to the land their goods came from. 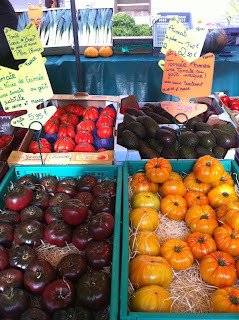 Having said that, there was one cheerful vendor at Marché Jean Jaurès who seemed to be making the effort to stock local and artisinal products, such as confiture faite maison, various nuts from different regions in France, and beautiful French tomatoes that reminded me of Céline's lovely article about her favorite tomato varieties of Southwestern France. Marché Jean Jaurès is small and unimpressive when it comes to it's selection of fish and meat, but one should hesitate judging a market by it's coverage, because the treasures of this marché can be found in the simple pleasures of the season's last local tomatoes and the abundance of Fall's nuts and squash. While my quest for local producers continues, the Marché Jean Jaurès is a fine place to stop by for residents of the 19th arrondissement looking for a few local gems.